The Duplex Steam range provides one of the most versatile floor cleaning machines available. They wash, mop, scrub, dry and sanitize all floor surfaces in care homes – in bedrooms, bathrooms, treatment and sluice rooms, communal rooms and corridors. With the unique Duplex Steam floor cleaning machine floors are left clean and sanitised with ease. 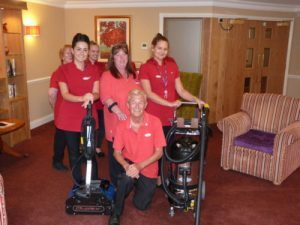 Hallmark Care Homes, the family-run provider of multi-award winning care homes have started to introduce the Duplex 340 Steam and Jet Vac Eco throughout its homes. The 340 Steam has been supplied with colour coded brushes in line with the Department of Health’s guidelines on colour coding for cleaning to prevent the spread of infection. The Jet Vac Eco is used for chemical free cleaning of upholstery and curtains. The Eco is also perfect for cleaning windows, tiles, grouting, sinks, toilets mattresses, in fact any hard surface where cleaning and sanitization is required in the care home environment.